There’s been quite a bit happening since we sent out the last newsletter. Communities have been progressing – and in some cases completing – repair and rebuild work, and NAFA representatives have visited all of our project sites. 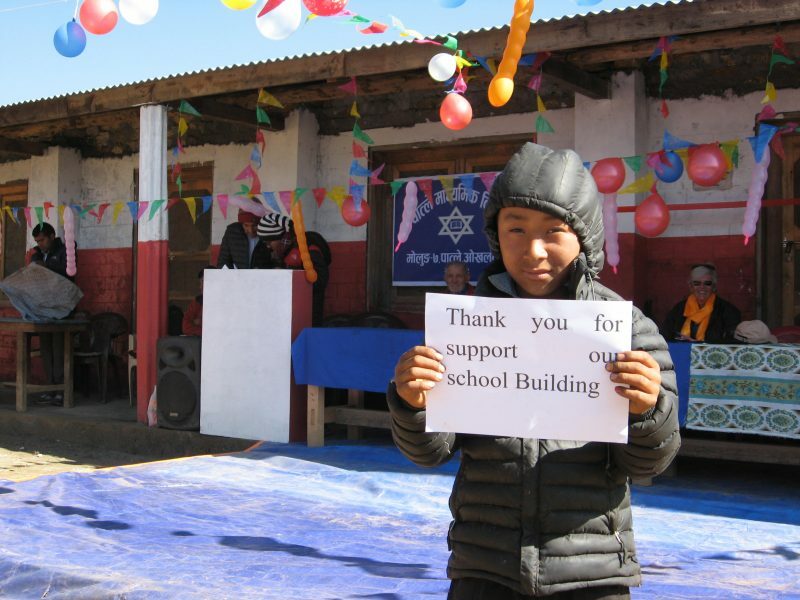 This year, we hope to complete all of the rebuilding work. This will be a massive achievement for our volunteer-run charity and the villages that will have benefitted. NAFA will be forever grateful for the generosity of its supporters, particularly since the earthquake. 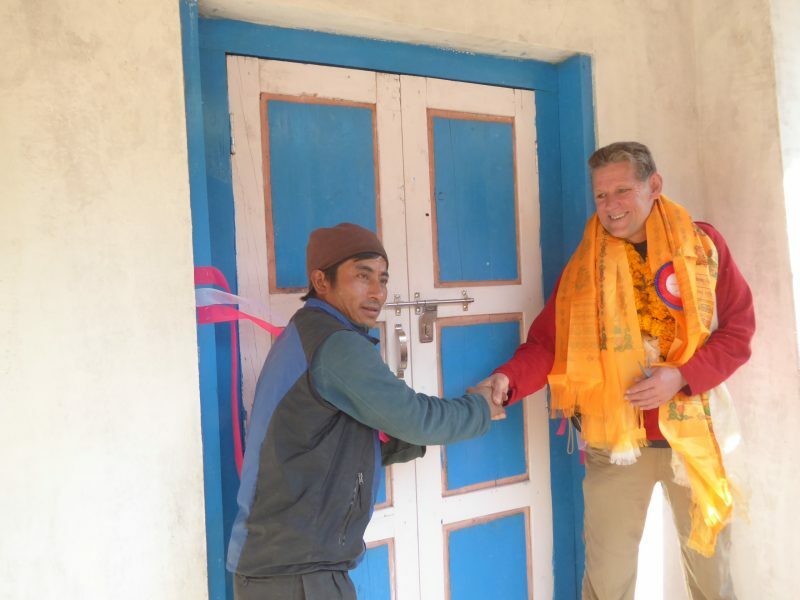 NAFA’s Ross Hazelwood helping to cut the ribbon at Kophu school with Bai Bahadur Rai. 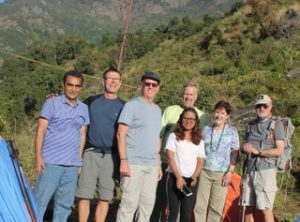 Two of NAFA’s executive officers (Brenda & Ross Hazelwood) joined seven NAFA members on a 17 day trek last month to visit each of these remote villages in eastern Nepal, inspect the work and join in the opening celebrations. NAFA undertook to rebuild 21 classrooms which were destroyed in the 2015 earthquake in the eastern districts – 3 classrooms in the Kophu village, 3 in Dhupisurke, 5 in Shyama and 10 in Patle. The builders were justifiably proud to complete the work. 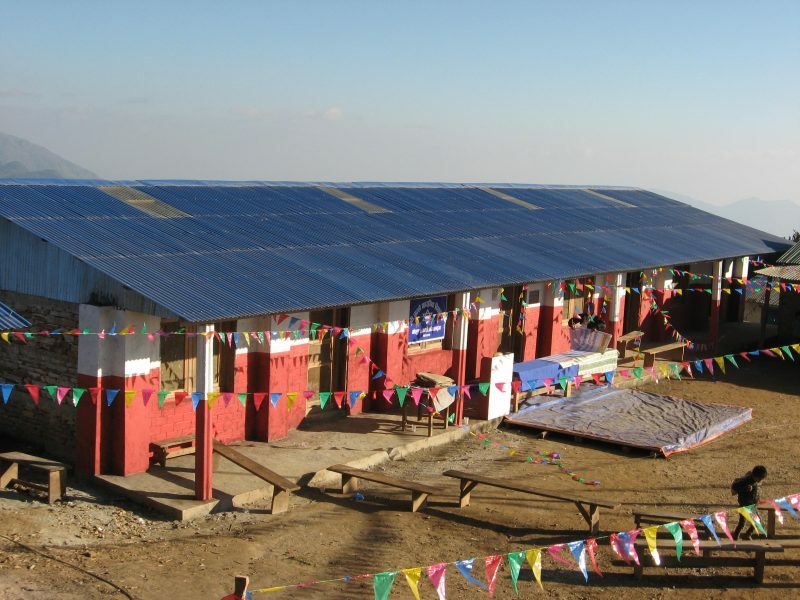 After 12 months of work to obtain government approval for the earthquake-resistant building plans, it took another 12 months to build the classrooms though extreme weather conditions such as snow in the winter and the monsoon. The school committees kept NAFA up to date with the progress of building. In the late stages of the project, NAFA architect Sabin Shrestra and building administration manager Manish Bhadra joined NAFA executives to visit Shyama and Patle to inspect the classrooms and to check the building guidelines were followed. 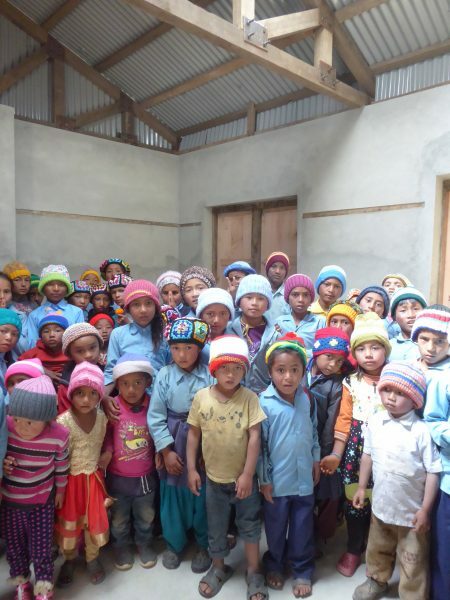 Thanks to NAFA, local builders and volunteers, all classrooms in the NAFA-supported villages in the Solu Khumbu, Okhaldhunga and Dolakha districts are now rebuilt. The children and teachers are enjoying their new weatherproof environment. The opening celebrations in January (attended by NAFA executives and members) included a formal ribbon-cutting ceremony to open the classrooms. At each school, the NAFA representatives were met with a long line of children with welcoming garlands and silk kartas. The young children sang their national anthem and performed their local ethnic dances. The parents, teachers and children at these schools wanted to pass on their overwhelming thanks to NAFA donors and friends for their generosity! 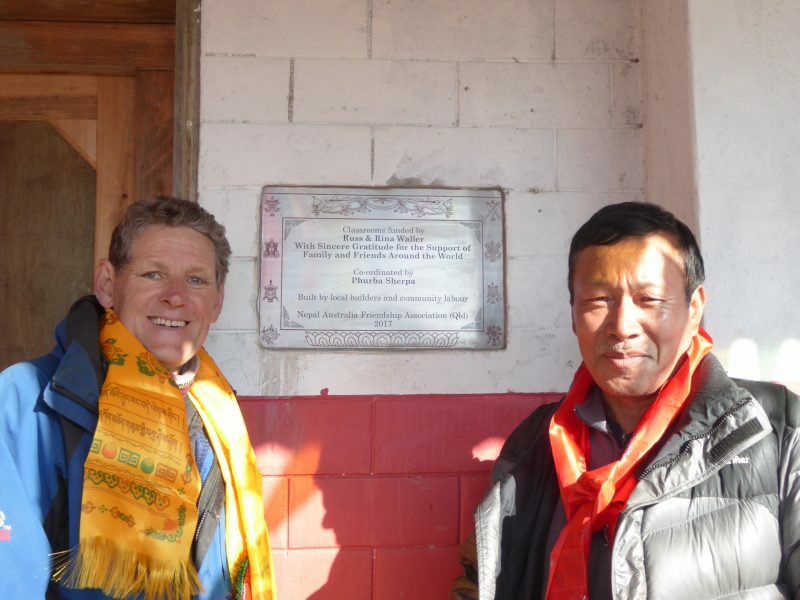 In November 2017, Allan English and Mike de Gruyter of the English Family Foundation (EFF) joined NAFA President Rod Setterlund, Deb Setterlund, Rick Parkes, Khilraj Pandeya and Pratika Shakya (Joy Foundation Nepal) for a whirlwind visit to Pasang Chowk Agricultural Cooperative in the Tawal area. 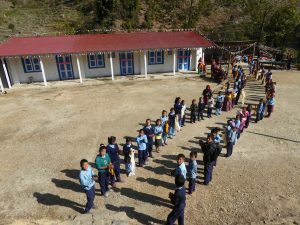 The group was treated to a warm school welcome, followed by a small ceremony at the monastery, and a cultural program at the school, and before they left, they joined local school children in the traditional Mendo Maya Tamang dance. The EFF, based in Brisbane, generously provided funds to partner with NAFA in helping re-establish the Cooperative after the Gorkha earthquake in 2015. The EFF had also funded a Cooperative-run project to set up a plant/tree nursery and reforestation program. Allan and Mike contributed their extensive knowledge to discussions about marketing and developing a point of difference and appropriate branding that would distinguish Cooperative products from others in the marketplace. They also had a detailed look at the Savings Bank operated by the Cooperative. The Savings Bank, established in 2013, now has 435 depositors from four villages in the area. Funds deposited are immediately loaned out to Cooperative members under a micro-finance model. 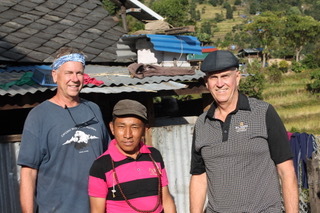 Allan and Mike quickly concluded that increased loan capital could support Savings Bank infrastructure, agricultural, and other small business development, with Mike subsequently providing a generous donation to increase the loan capital. 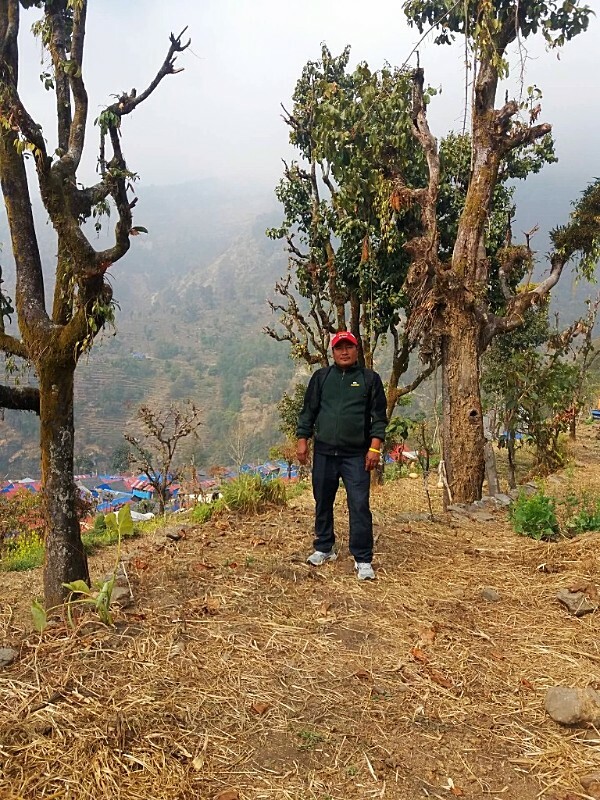 The pair was impressed by the multiple roles that community members play in the Cooperative, for example the senior math teacher, Ramesh Tamang, keeps the books for the Savings Bank on a volunteer basis. Membership of NAFA supports the administrative costs of our work in Nepal, so that we can promise donors 100% of donations go to projects. Members are welcome to participate in monthly management committee meetings and the AGM, and can nominate for a position on the management committee. Membership costs $20, payable at the start of each calendar year (now!). 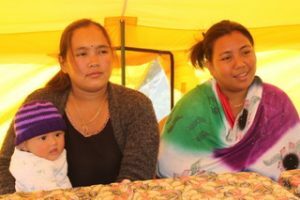 Late last year, NAFA appointed Rebika Lama Tamang, a passionate local advocate for women’s development, to the role of Social Mobiliser. The two year-funded role aims to improve health, education and economic outcomes by empowering women to make a difference in their communities. One of Rebika’s first projects was to establish a bag-making enterprise. Also on Rebika’s agenda is: the production of re-usable sanitary pads, consulting with school students about feminine hygiene,a women’s health camp, agricultural entrepreneurship and women’s skill development. 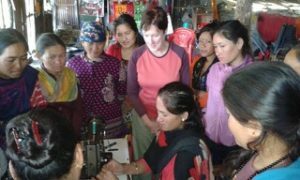 Tawal’s bag-making enterprise started during a visit by Deborah Setterlund (NAFA’s Research and Evaluation Officer) in November 2017. In the space of 3 days, amid a variety of challenges, women made 200 quality, reversible, washable tote bags for resale in Brisbane. 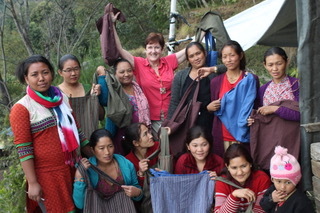 Nepali plain and striped cotton material was purchased in Kathmandu and transported to Tawal. 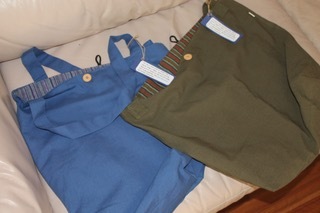 But time was short and with only 3 full days to make the bags, the pressure was on the 15 eager women tailors. Problems arose like dew in the grass with a lack of flat surfaces to cut out the material, the difficulty of handling 32 metre bolts of cloth, no sign of any pins to help with construction; not to mention the regular distractions of toddlers and chickens roaming around the work space. Day one saw the production of only three bags! Rebika worked calmly to field the numerous questions and help organise the crew and after an experienced tailor was assigned to cut the pieces and oversee quality control, the task became much more streamlined with the sound of whirring machines permeating the village and a total of 167 bags completed on time with more to come. Bags are now for sale, but be quick, they’re selling fast. If you want one, please email Deborah at setterlund@hotmail.com. Last year, with funding from donors, Brenda Hazelwood (NAFA’s Vice-President) delivered 150 washable/reusable cloth sanitary kits to women in the Kathmandu central jail who were extremely grateful. Sanitary wear is not provided in jail so women without family support find this very difficult. Furthermore there is a growing problem across Nepal regarding the disposal of cheap commercial sanitary pads which, according to research, take up to 800 years to disintegrate. 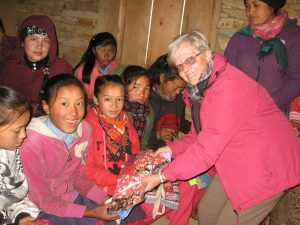 This year, with the help of generous donors, Brenda was able to extend the program to provide 370 kits for the women in remote jails such as Ilam, Jhapa, Palpa, Chitwan, Birgunj and Pokhara. 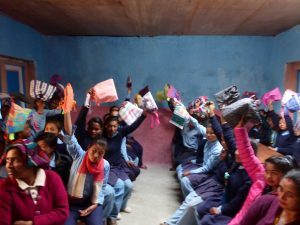 These kits were delivered and distributed by Indira Rana Magar from Prisoners Assistance Nepal who works closely with the women in these areas. Historically women have used handmade cloth pads. As cheap plastic commercial pads have become available and widely advertised, women, mainly in the cities who can afford them, have opted to purchase the commercial pads. 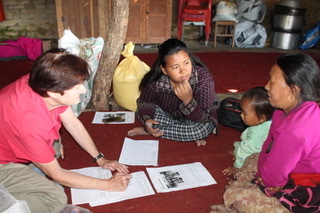 To slow this process in the remote areas, Brenda held information sessions with over 200 female students, teachers and mothers in the villages of Kophu, Lumsa and Patle to discuss their current practices and the problems in disposing commercial pads. The majority of women in these areas are still using handmade cloth pads and were delighted to receive these well made cloth shields and pads. 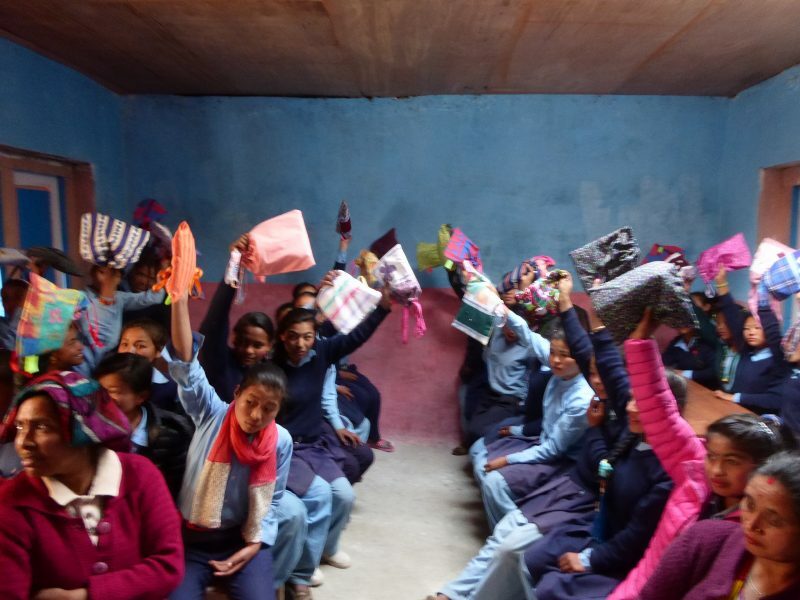 The shields were purchased from the Days For Girls agency in Kathmandu but the liners were sewn by NAFA student, Suni Rai before being assembled into packages for distribution. An astonishing 600 metres of cotton fabric was cut and sewn for these pads! After a long and exhaustive search, land for a new health centre, serving five villages in Tawal has been purchased. The old health centre, built in 1999 with NAFA and AusAid funding, was destroyed by the Gorkha earthquake in 2015 and subsequently, a geological assessment by an engineer, revealed that the area above the health centre was a landslide risk. Since then, the locally based NGO Hilly Region Development Club (HRDC) has been searching for land suitable for the health centre and negotiating with prospective sellers whilst trying to remain within a reasonable budget. This proved difficult as there was no community owned land near the main village of Tawal and farmers who have owned and farmed in the region for generations are understandably reluctant to part with their land. In January 2018 a breakthrough was made with the purchase of well-located land 50m x 17m within the available budget. A Memorandum of Understanding has been signed and a deposit paid, with the registration of the land in the name of the HRDC in progress. Funds for this land and building project were raised largely through a fundraising event organised by Ray Baker at Backtrack, as well as a crowdfunding campaign. Construction of the new five room health centre will commence later this year when local builders have completed the rebuild of the Tawal area school. 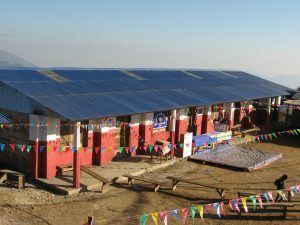 In the meantime, the health centre will continue to operate out of two emergency shelter rooms built by the army after the earthquake. NAFA again wishes to thank everyone who contributed so generously to the rebuild of the Tawal Health Centre. Watch this space for future updates.